"I love being an orthodontist! I find immense reward in creating beautiful smiles, and witnessing the transformation in self-confidence that follows." I sincerely care about each one of my patients, and work hard to deliver an outstanding result in a warm, comfortable environment. I take the time to get to know my patients personally, and to understand their unique orthodontic needs before customizing their personal treatment plan. Once you’re a patient, I will monitor progress closely and tailor treatment along the way to deliver a truly beautiful result. Our boutique practice is well known for our specialized focus on creating “broad, beautiful smiles.” I am always mindful of enhancing the aesthetics of the face so that it is in well-balanced harmony. My goal is to go beyond the traditional standards of straightening teeth to transform your smile and display the best version of yourself! Dr. Cheryl currently lives in the beautiful community of Carmel Valley, in San Diego. She grew up calling many places home, thanks to her father who served in the U.S. military. She lived in South Korea, Washington State, New Jersey, and several cities throughout California. Dr. Cheryl married her husband Mike in 2009. Together, they have a spunky little daughter, Isla (pronounced like the first part of “island”). After only three years of undergraduate studies, at the age of 20, Dr. Cheryl was awarded a B.S. in business finance from Cal Poly, San Luis Obispo. She lived and worked in San Diego for several years before returning to school to pursue her dream of becoming an orthodontist. She attended the highly regarded School of Dentistry at University of California, San Francisco where she was awarded the Osher Scholarship for academic excellence, leadership, and outreach service to the community. While at UCSF, Dr. Cheryl won a competitive research fellowship that provided an exceptional opportunity to investigate the cellular mechanisms underlying craniofacial development. Dr. Cheryl also served as president of the American Dental Education Association at UCSF, as well as the chair for community outreach. 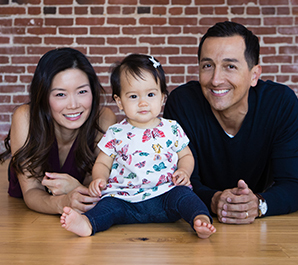 Upon graduation from UCSF, Dr. Cheryl was immediately accepted into a postdoctoral residency in orthodontics at the University of the Pacific. She received progressive training in a state-of-the-art clinical facility, worked alongside some of the world’s foremost experts in orthodontic treatment, and continued research in the field of craniofacial genetics. Dr. Cheryl maintains part-time faculty status at the University of the Pacific Department of Orthodontics. Dr. Cheryl has volunteered her time to underserved communities. In San Diego, she served as a clinic manager with the UCSD free dental clinics, and providing dental care to individuals without the means to be treated. She also volunteered both locally and internationally in cleft lip and palate missions to help repair these defects: a process that starts from birth and continues into early adulthood. Dr. Cheryl’s passionate about providing mentorship to young individuals; she loves to cultivate future dental professionals! By sharing her own experiences, she inspires them to achieve their own academic and professional success, and encourages them to find ways to give back to their communities.